I met my husband Amos in 2007 via Yahoo personals. &bsp;We were both 39, he had been married before and had two kids. &bsp;I had never been married and was childless (and still am). 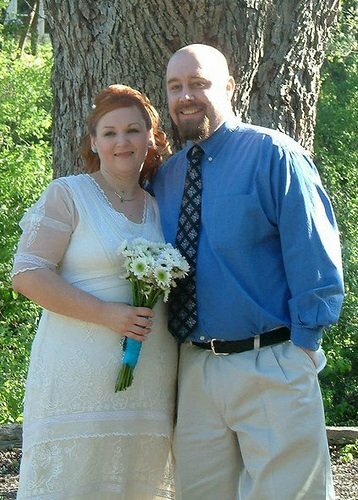 &bsp;Years before I met my husband I was fatter than I am now then proceeded to lose a whole lotta weight before we met. &bsp;When I met Amos, I had gained some of the weight back- I was probably about a size 10-12 at the time. &bsp;Since we've been together I've gained some more and am closer to my normal size currently. &bsp;I'm about a 14-16 now and I've also got a chubby hubby. We are active- we go to the gym together and we play water volleyball with a group of friends. &bsp;We also like to go out to eat, watch baseball, watch tv and go shopping. &bsp;We are normal people. &bsp;He tells me every day that I'm beautiful and I truly feel that way now. &bsp;We seem to be a perfect match for each other and I feel so lucky to have him. &bsp;I'm much happier with him than I've ever been before. I suppose that all of us have to sift through a lot of shallowness in dating, no matter what our size. &bsp;However, when I was skinny I found that 1. &bsp;a lot of guys seemed to be especially interested in me because of my size and 2. &bsp;I actually had guys quiz me on what I had eaten or how many miles I had ran that day. Amos loves me through and through, and calls me beautiful every day. &bsp;If we go to the gym on a particular day, we have fun together, and it's awesome. &bsp;If we skip the gym and go out to eat instead, that's awesome too. &bsp;I can't imagine being with anyone but him.